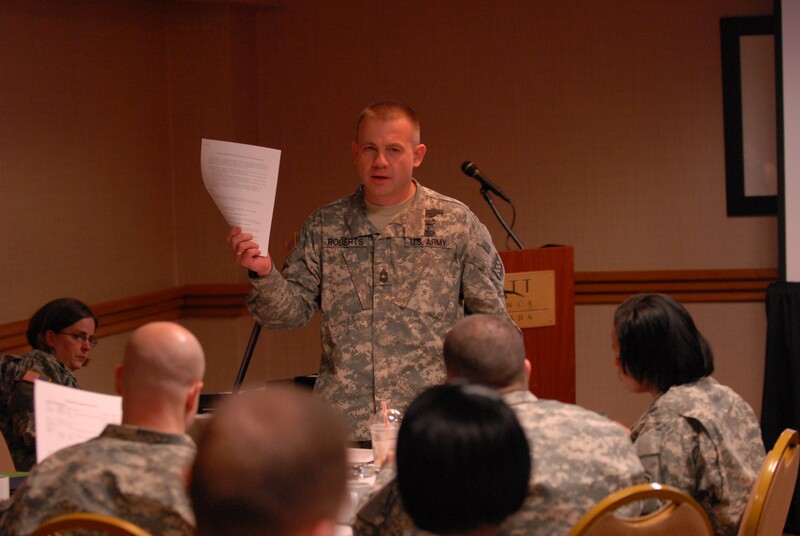 More than a dozen chaplain assistants from across the country attended the first-ever Chaplain Assistant Mentorship Program hosted by the Army Reserve's 99th Regional Support Command March 12-13 in Bethesda, Md. The two-day event offered training and mentorship by senior chaplain assistants in subjects ranging from Unit Ministry Team cohesion to confronting death on the battlefield to obtaining religious supplies on a limited budget. "I felt there was a huge need for chaplain assistants to have a place and a way that they could come and get some training and engage each other," explained Master Sgt. Daniel Roberts, non-commissioned officer in charge of the 99th RSC chaplain section. "In the Army Reserve, chaplain assistants are not being mentored because, a lot of times, they're kind of remote from the next higher chaplain assistants." "I wanted to give folks an opportunity to come and get trained, to get mentored, to grow as non-commissioned officers, and to grow as people," he added. 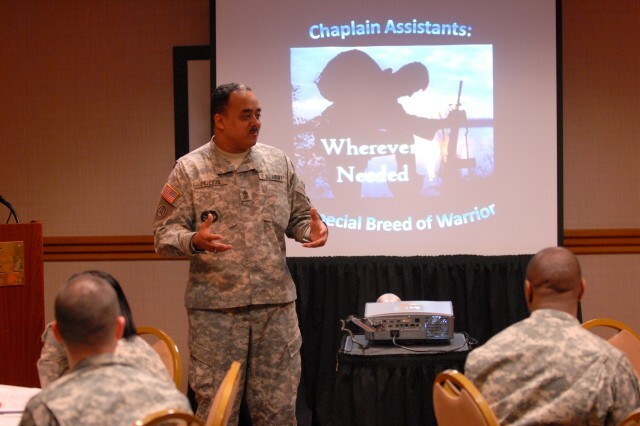 Chaplain assistants hold a very special Military Occupation Specialty, providing various types of support to the chaplains and other Soldiers with whom they serve. "A chaplain assistant has a couple of roles; he's a minister, he's an administrative guy for the chaplain, but he's also supposed to be able to handle a weapon," explained Roberts, who deployed as part of Desert Shield/Desert Storm in 1990-91, to Haiti in 1997 and Kosovo in 1999. "The Unit Ministry Team - the chaplain and the chaplain assistant - is a very integral part of any unit and our job is very unique in the fact that what we are called to do is nurture the living, care for our wounded, and also honor the dead," explained Master Sgt. Lorenzia Henderson, chapel NCOIC at ASA-Fort Dix, N.J. "Our mission is very important to supporting our Soldiers." It was a desire to support the unique mission of chaplain assistants that led Roberts, with the support of 99th RSC Chap. 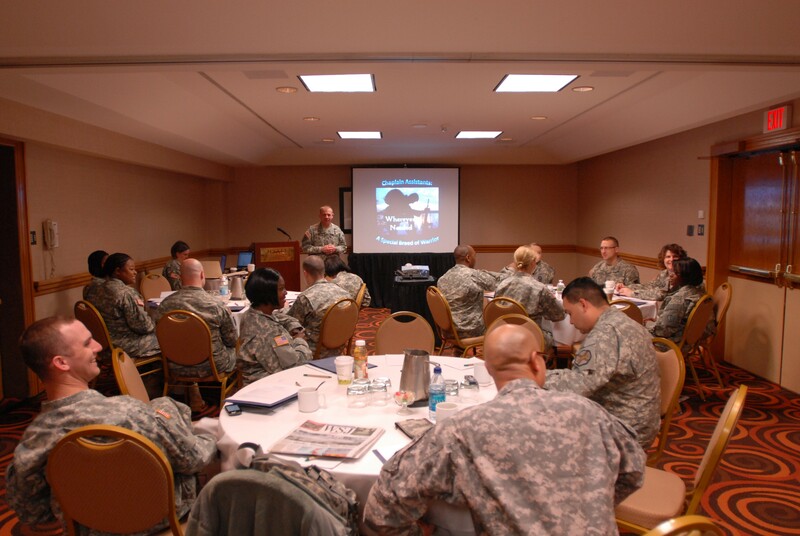 (Col.) Kenneth Kirk, to implement the 99th RSC Chaplain Assistant Mentorship Program, or CAMP. "This is where the 'rubber meets the road,' right here...taking care of Soldiers," said Sgt. Maj. Jesus DeJesus, acting command sergeant major for the 99th RSC. "CAMP is not only going to make us stronger, it's going to make this organization stronger, and that's why we need it." CAMP is the brainchild of Roberts and two former 99th RSC chaplain assistants, Henderson and Sgt. 1st Class Fred Cohen, and all three served as trainers and mentors for the event. "The most important aspect of this training is cohesion; training chaplain assistants to understand the importance of cohesion - because the Reserve units are so spread out - and meeting all those other chaplain assistants who are in the region and sharing ideas, success stories and best practices," said Henderson, an Iraq War veteran and former Marine. "There is a serious lack of MOS-specific mentorship from the senior level just because we are so spread out and we don't operate in units with other people in our MOS," explained Cohen, chaplain section plans and operations NCO for First Army Division East, headquartered at Fort Meade, Md. Cohen said the idea for a chaplain assistant mentorship program originated with Henderson during his time with the 99th RSC, then grew into a two-day chaplain assistant workshop this past year during Cohen's service with the 99th RSC, and finally blossomed into CAMP under Roberts. "Master Sgt. Roberts has taken it to a whole new level, taking what we did last year, building on it and really expanding the program into something that we didn't even think was possible," said Cohen, who deployed to Afghanistan in 2008. Roberts has expanded the program beyond the 99th RSC's 13-state northeastern region, accepting Soldiers from around the country who fall within the other three RSC's areas of responsibility. This is because the Operational, Functional and Training commands that sent their chaplain assistants to CAMP are not constrained by the same geographical limits as the RSCs, but rather have chaplain assistants serving in units scattered across the nation. "If they want to come, they're welcome to come," Roberts said. "My goal is to provide the training that they need." According to several of the Soldiers attending CAMP, they're getting exactly the kind of training and mentorship they need to become better chaplain assistants. "For the chaplain assistant corps to launch its own training strictly for chaplain assistants was very much needed," said Sgt. 1st Class Jose Montes, chaplain assistant NCOIC for the Mobilization and Deployment Brigade, Fort Bliss, Texas. "This is definitely long overdue." "We hadn't heard of training like this specifically for chaplain assistants, so I think it's a great training opportunity," said Staff Sgt. Cynthia Thomas, chaplain assistant NCOIC for the 158th Infantry Brigade, Camp Shelby, Miss. "As a whole, chaplain assistants need to take advantage of training opportunities." "Even from a junior-enlisted perspective, they cover so many areas that are applicable all the way up to sergeant major," added Pfc. Rebecca Holzmann, chaplain assistant with 4th Brigade, 95th Division. A second CAMP weekend was held March 18-20 in Pittsburgh, and Roberts plans to expand the program in the future using lessons learned from this inaugural iteration of CAMP. "I love training; it's where my heart is," concluded Roberts.